The six major stages of the product lifecycle and the market dynamics that often conspire over time. The pricing strategies that are commonly employed at different stages and why they are problematic. The four things that leading pricing organizations are doing differently to mitigate the challenges. How to be proactive about price management in the most important stage of the product lifecycle. Categories and sample questions for developing effective marketing research interview guides. A robust and well-rounded interview guide can be constructed by just developing one question in each category. Pricing pressure is just a fact of life. But how well you handle that pressure can determine whether your business ultimately succeeds or fails. 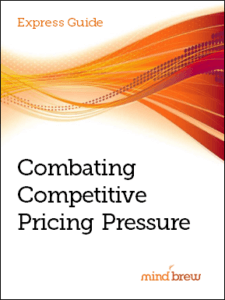 This guide exposes 15 ways to address (and prepare for) competitive pricing pressure. To help identify areas for improvement and help gauge the competitiveness of your company's strategic and tactical pricing capabilities, simply answer the 52 questions in this straightforward self-assessment as truthfully and objectively as possible.